It was one Saturday back in September that I had much my most positive experience with officers of the New York Police Department. 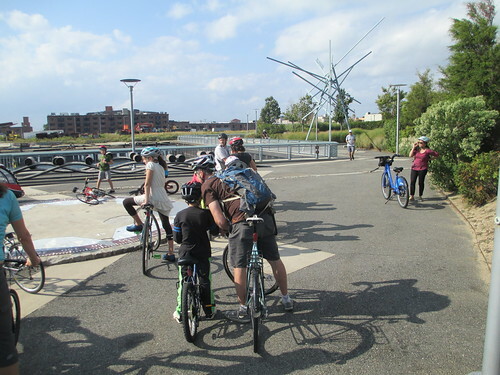 My family and I were taking part in a Kidical Mass ride for families from a park in Gowanus, near our home, to the Brooklyn waterfront. Two bike patrol officers from the NYPD’s 78th precinct joined us, as did a community relations officer and Frank DiGiacomo, the precinct commander. The officers stopped traffic to allow our families to ride through difficult intersections and chatted to us as we rode along. By the time we reached Pier Six looking across to Manhattan, I was feeling warm enough towards them to try a gentle joke. “I suppose I don’t really need to ask a police officer whether he’d like a doughnut,” I said to one of them, as I proferred him a bag of police officers’ favourite treat. He felt sufficiently friendly in the other direction that he replied with a friendly punch to my shoulder. 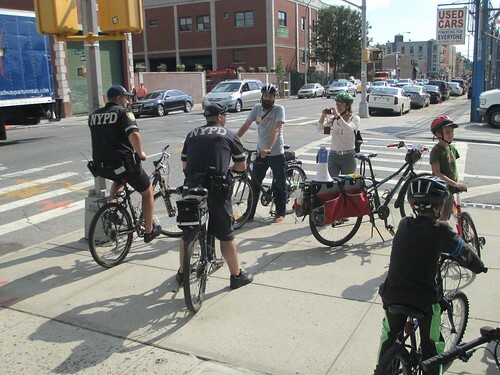 I’ve been thinking about that incident in the last few days because of an appalling act of brutality against two NYPD officers just a few miles from where I gave the bike patrol officers their doughnuts. On December 20, as my family and I were packing for our Christmas break in the United Kingdom, Ismaaiyl Brinsley, a 28-year-old black man, walked up to a police patrol car and shot the two police officers inside - Wenjian Liu and Rafael Ramos – in the head, killing both. Brinsley, who had posted anti-police messages on Instagram, then ran into the Willoughby Avenue subway station and, as police closed in on him, shot himself fatally in the head. Given that Brinsley’s aim appears to have been to kill New York police officers no matter who they were, he could just have easily targetted any of the four who accompanied us. 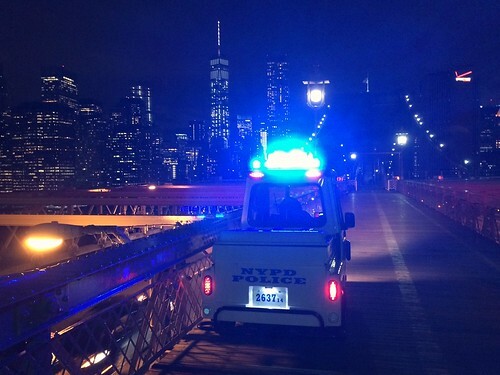 The incident has challenged me to consider whether I, as someone who’s regularly complained about the attitudes of the NYPD both over traffic policing and race relations, helped to create the atmosphere that led to Saturday’s horrendous deaths. Pat Lynch, president of the Patrolmen’s Benevolent Association, the New York police union, expressed fury in the wake of the crime over the criticism his members have faced in recent weeks. "There's blood on many hands tonight - those that incited violence on the street under the guise of protest, that tried to tear down what New York City police officers did every day," Lynch said outside the hospital where the officers were taken. "We tried to warn - 'it must not go on, it cannot be tolerated’. That blood on the hands starts on the steps of City Hall, in the office of the mayor." these past few days to reflect on Pat Lynch's criticisms. Lynch’s comments, although intemperate, have made me look back on that September bike ride and wonder if those cycling officers perhaps represented a truer face of the NYPD than I’ve previously recognised. I’ve consistently focused on the negatives about the force. As a well-off white person, after all, I don’t rely as heavily on the police’s protection from crime as residents of the Tompkins Houses public housing, outside which Liu and Ramos were sitting. 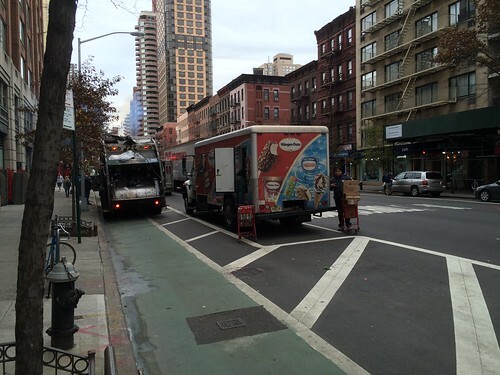 I encounter officers mainly when they’re in my way – for example, when they’re blocking bike lanes. Since the police department’s handling of the issue that most acutely concerns me – road safety – is grossly inadequate, I’ve tended to feel resentful when I’ve encountered individual police officers, especially when they’re engaged in some pointless traffic policing. Because statistics show that there are disproportionately high numbers of brutality claims from blacks and Latinos, I’ve sometimes assumed that pretty much any police officer I encounter is likely to be racist. It’s easy for someone such as me to ignore the effects of, say, last year’s sharp drop in New York City’s murder rate. That was achieved, according to the police, by examining patterns of Facebook and other messages surrounding gang violence, particularly in The Bronx. They brought conspiracy charges against the associates of those responsible. I’ve sometimes, I suspect, drifted close to the same thinking error as Ismaaiyl Brinsley, by viewing individual members of the NYPD as if they were responsible for the collective failures of the group or its culture. Liu and Ramos, as far as I know, were no more responsible for the wider failings of their department than I am responsible, say, for the conduct of cyclists who misbehave on the roads, or for the shortcomings of other British journalists. Yet it remains fatuous to pretend that Brinsley decided to act as he did other than of his own free will. Even if the protesters’ rhetoric had not been mostly admirably temperate, only Brinsley himself decided to pervert the understandable, justifiable anger over the police’s killing of Eric Garner in Staten Island and Mike Brown in Ferguson, Missouri, into murderous rage against individual officers. The story is at least complicated by Brinsley’s having shot in Baltimore, before he headed to Brooklyn, Shaneka Thompson, his girlfriend, who is not a police officer. She remains in hospital. doesn't mean it's not hard to do. It makes no more sense to claim protesters somehow prompted Brinsley’s misdeeds than to claim that the NYPD somehow deserved them. Instead, Brinsley was acting like the worst of the police officers he so hated. He showed the nihilistic lack of self-control that is a hallmark of many police brutality cases. Like the worst police officers, he used unjustified violence in such a way that the victims would have no reasonable chance to respond. He seems to have shared with violent cops a determination to impose his will on others no matter the havoc he risked unleashing. It is certainly an important distinction that police officers are sometimes entirely justified in using violence, in a way that ordinary citizens seldom are. It’s also critical, however, that police officers are expected to act with discipline and self-restraint in a way that no-one expects a common criminal to do. It’s vital to point out the balance of risks. New York police officers kill multiple unarmed people every year, yet Saturday’s killings were the first of an NYPD police officer on duty since 2011.
individual officer - that's racist. US Society, however, shouldn’t be tolerating even that limited amount of violence against police officers – just as it most assuredly should not tolerate the casual tossing aside of black people’s lives. While Ismaaiyl Brinsley had no justification for his brutal killing, there was also no justification for the actions of “pro-police” demonstrators who on Friday evening, the night before Brinsley’s attack, paraded outside New York’s City Hall wearing, “I Can Breathe” sweatshirts. The shirts mocked the proliferation among protesters of sweatshirts bearing the legend, “I Can’t Breathe” – the words that Eric Garner gasped out 11 times as a police officer throttled him on a Staten Island sidewalk. It’s critical if this rift is to be healed to get away from the divisive rhetoric that currently disfigures nearly every debate in US public life. While there are certainly intemperate anti-police voices, there’s an equally disturbing tendency for any web story about a police killing of a young black man to become infested with slanders and lazy assumptions about the person’s lifestyle or behaviour. US society has, somehow, to learn again to recognise the humanity of people on different sides of its profound racial and ideological divides. I would normally offer policy prescriptions for how I think that can be achieved. But, after a year of chronicling dispiriting car crashes and a miserable deterioration in the US’s race relations, this final blow feels as much emotional and spiritual as practical. Brinsley twisted a knife in deep wounds that Eric Garner’s killing, the non-indictment of his killer and many other cases have left in New York’s body corporate this year. Given the time of year, I’ve been prompted regularly in recent weeks to advocate that somehow the wider city could be more like the Episcopal Church I attend every Sunday in Park Slope. The congregation is made up of a vast range of people – around half of them black – of many different ages, backgrounds and sexual orientations. There is what feels to me, as a relative newcomer, a remarkable sense of unanimity for such a diverse group. I attend the church partly because its clergy have been so quick to recognise the spiritual importance of contemporary events in the US. I’ve sat at points in tears as preachers have related the injustices that people who in some cases live very close to us have suffered to ancient spiritual themes and long-ago suffering. While I know that few if any of my readers will share my specifically Christian experience of the last few months’ events, I imagine I can’t be the only one who’s had a sense of something truly momentous happening. The questions feel bigger than individual human beings. I found myself describing to my wife recently the powerful sense I’ve experienced at points in recent weeks of how my faith relates to my feelings over the injustices I’ve seen being perpetrated. I have a similar sense about Michael Brown’s death in Ferguson, Missouri – and about the fates of the many victims of traffic crime that go neglected by the police and criminal justice systems. They’re thoughts that will, I’m sure, seem to many like the kind of foolish sentimentality against which I normally rail. To atheists, they will seem like the kind of deliberate missing-of-the-point of which they accuse all religious people. But, for the moment, I also can’t help feeling that the central figure of my faith in some sense also sides with officers Liu and Ramos. Five days before Christmas, Jesus lay on the sidewalk beside them as paramedics worked in vain to undo yet another senseless injustice. The chanting on the night of December 4 sounded muted heard from my eighth-floor office. But there was no mistaking what was going on. 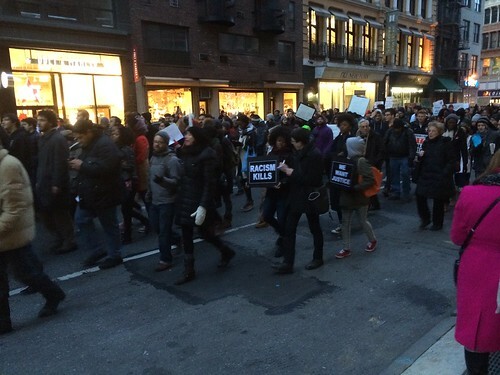 Rushing over to the window, I peered down into Hudson Street and saw the front of a line of hundreds of protesters. 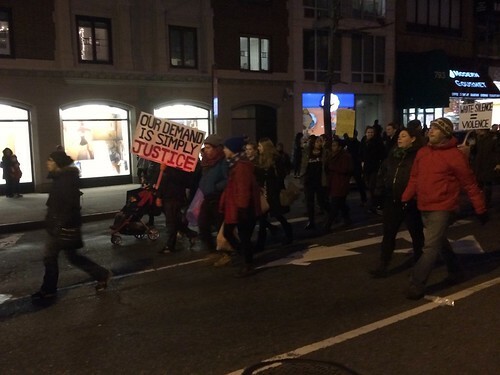 The leaders were carrying black placards with slogans picked out in LED lights. “Justice 4 All” and “Black Lives Matter,” they read. I felt admiration and fellow-feeling for the demonstrators, protesting against the decision of a grand jury in Staten Island, just across New York Harbor from where I was, to bring no charges against the police officer who killed Eric Garner. The officer placed Mr Garner, a black man, in an illegal chokehold in July as he sought to arrest him for selling untaxed cigarettes. The protesters were shouting “I can’t breathe” – the last words that a video of the event captured Mr Garner gasping out 11 times. far from determined to uphold the rules themselves. But I faced an immediate problem - how, with protests swarming over much of lower Manhattan, I would get myself and my bicycle home to Brooklyn. I opted for a route somewhat to the north of my normal one and successfully reached the Manhattan Bridge. Yet my biggest challenge turned out not to be the protests but the behaviour they encouraged in drivers. Many expressed their frustration at being delayed by driving into cycle lanes, executing illegal u-turns, honking loudly and otherwise behaving irresponsibly and illegally. The experience was, it subsequently occurred to me, an excellent encapsulation of the crisis in policing of both the US’s roads and minority – especially black – communities. Far from looking down on the law, the most vulnerable people – the protesters, people who don’t own cars – have high expectations of law enforcement. Fair, undiscriminatory enforcement of society’s agreed rules is their main protection against those who have more power than they - or operate vehicles with greater momentum. Meanwhile, it’s the people commonly regarded as upholders of society’s order – police officers and those who have taken driving tests and invested in cars – who often seem, consciously or otherwise, to hold those rules in most contempt. Many seem to think themselves responsible or respectable enough not to need to follow the pettifogging details of the rules. with the Stars and Stripes on the towers. The episode brought to mind a famous passage in which Immanuel Kant, the 18th century German philosopher, wrote about how justice’s significance went far beyond any practical effect its execution might have. Kant expressed his views in relation to the death penalty – and took a position about the morality of capital punishment with which I profoundly disagree. But his take on justice’s significance captures something of why the families of Eric Garner in Staten Island and Michael Brown in Ferguson, Missouri – as well as those of Allison Liao, killed by a driver in Queens, and Cooper Stock, killed by a driver on the Upper West Side – protest so loudly over the system’s failing them. The acute problem, however, is not so much that the US – and some other societies worldwide – is failing to prosecute some brutal police officers and many, many negligent or even deliberately violent drivers. It’s that by doing so the authorities send a message to those who follow the rules that they’re mugs. Refraining from violence at risk to yourself, police officer? Why not just grab the suspect round the neck? Ignoring that cellphone call so you don’t endanger other road users, taxi driver? Why? It might be a customer calling to book a long, profitable ride. The challenge is less that the guilty are going unpunished and more that virtue is punished by default. These ideas started forming in my mind nine days before the December 4 protests, as I took a bike ride on a rare day off work the Tuesday before Thanksgiving. I rode from home in Brooklyn all the way up Manhattan’s 1st Avenue towards The Bronx. Yet it was soon apparent that the relatively new protected bike lane north of 60th Street wasn’t going to live up to its promise. I had to leave the lane repeatedly and pull into fast-moving traffic. 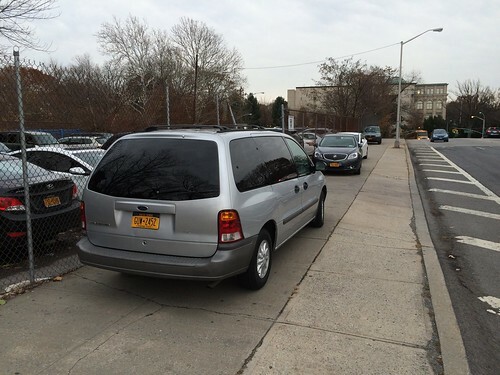 Some of the obstructions were because of building work – but most were because cars were illegally parked in the bike lane or improperly turning across my path. More than once, on pulling out of the lane and round the legally-parked cars, I found a third barrier in the form of an illegally double-parked truck. At one point, I found a huge semi-trailer truck (articulated lorry, British readers) had blocked the bike lane to deliver to a store. I appealed to a nearby traffic police officer to ticket the driver. The driver treated her with contempt and berated me, as a proxy for all other cyclists, for having forced him to park there. A previous cyclist had, apparently, sued after the driver struck him with a trolley while moving goods across the cycle lane from a legal parking place. about its officers' conception of enforcing the law. 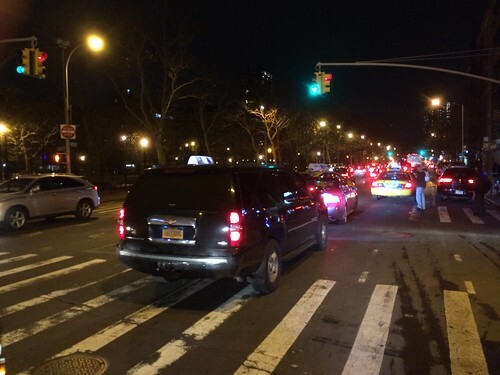 It was no surprise when, later in the ride, I had to manoeuvre delicately around police cars parked illegally on the shared sidewalk and bike path outside the NYPD's 52nd precinct in The Bronx. None of what I experienced went beyond inconvenience and I suffered no real harm. But I was soon feeling humiliated and powerless in the face of the bullying of those who were refusing to follow the rules. I felt angry that so little was being done to ensure a more equitable, fairer outcome. Given my feelings over this minor injustice, I can only imagine the blind rage that Michael Cheung must feel over the failure to take any serious action against the driver who killed his 90-year-old mother as she crossed a street with the light in New York’s Chinatown in October. It must be indescribably painful for a mother such as Dana Lerner to hear that district attorneys are declining to bring criminal charges against the cab driver who killed her nine-year-old son, Cooper Stock, on the grounds the weather was bad when it happened. I spoke recently to the daughter of someone killed by a negligent driver while he cycled in Central London. She expressed her rage at the failure of the police there to investigate the crime thoroughly and of prosecutors to bring a prosecution over the case. It can only be worse still to learn that a relative has died because of illegal behaviour by those meant to uphold the law – and that those responsible will not be held to account. The killings of Eric Garner on Staten Island, Akai Gurley in East New York, Tamir Rice in Cleveland in countless other cases are shocking because they contradict so many of the theoretical principles of life in the US – and anywhere that human rights are held in any regard. A mixture of rage, impotence and grief that must boil inside the victims' relatives at the thought that many of these incidents happened mainly because of their family's skin colour and others' assumptions about people of their race. Police officers and district attorneys who flout the law or ignore rule-breaking not only disgrace their offices - and sometimes break the law themselves – but breach a fundamental clause in western societies’ social contract. Civil legal authorities centuries ago largely removed from individuals the burden of pursuing those who had criminally wronged them. The promise was that justice would be more fairly, impartially and efficiently dispensed when its pursuit was no longer clouded by issues to do with victims’ personal power, prestige, feelings or wealth. That principle has been abandoned, it seems, when it comes to many of those killed or injured on the roads or minority community members harmed by police officers. Many prosecutors in the US – and in the UK, I increasingly fear – are ready to pursue only cases where either overwhelming evidence or a plea-bargained guilty plea make a conviction nearly certain. On the rare occasions I cycle through New York’s Foley Square, past the steps that featured at the end of the classic legal drama Twelve Angry Men, I give a rueful smile at how such finely-balanced court cases increasingly seldom come to court. Despite my misgiving about Kant’s support for the death penalty, it’s hard to escape the conclusion that his feeling about a wider society’s guilt for unpunished crimes captures something about the deep wrong of the Eric Garner and other cases. If this behaviour isn’t regarded as wrong, if wider society imposes no consequences for these kinds of actions, what does it say about the wider society? 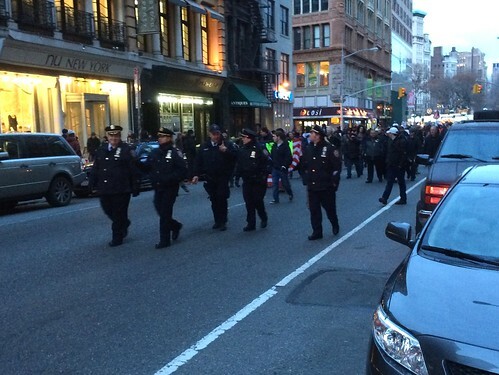 How far into lawlessness is society prepared to let its roads or its police officers descend? While the problems of unaccountability spread across the United States and some other developed countries, there are also very specific New York issues. Bill de Blasio stood as mayor on prominent pledges to improve police treatment of black people and to tackle the city’s epidemic of traffic deaths. It’s dispiriting that he appears so weak in face of his police commissioner’s apparent reluctance to act decisively on either. Yet the outrage I witnessed from my 8th floor window and the growing disquiet over traffic deaths give me at least some hope. The United States might finally be preparing, as Winston Churchill would say, to do the right thing, having exhausted all other options. have been depressing if we'd seen only sights like these. That hope was boosted this Saturday, December 13, when I took my son Christmas shopping by bicycle in Greenwich Village. We rode first up 1st Avenue and encountered drunk participants in the gruesome, annual Santacon bar crawl by young fraternity boy-types and like-minded women around the Lower East Side. The partygoers – who had noisily asserted their “right” to pursue their drunken binge in the preceding days – were the epitome, it seemed to me, of privileged refusal to follow generally accepted rules. They wandered over sidewalks, shouted across streets at each other and behaved self-indulgently and short-sightedly. But, even as I mentally shook my head over them, I heard the first protest chants. We arrived at the Strand Bookstore on Broadway just as the front of the Millions March NYC protest headed by. Many of the participants were of the same twenty-ish age group as the Santacon participants. 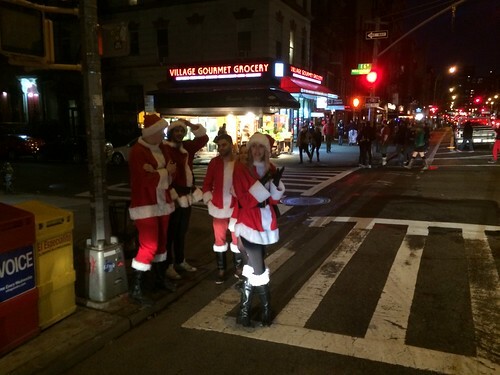 But there was an impressive earnestness about them that was entirely absent amid the Santacon foolishness. There were also far more of them than of the Santacon-ners. 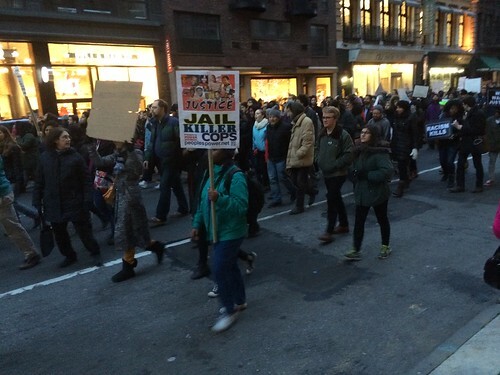 We emerged after 20 minutes in the bookshop to find the march still in progress down Broadway. We joined them for a symbolic two blocks, wheeling my bike and the Invisible Visible Boy’s trailer bike. NYC protest just before I and the Invisible Visible Boy joined. For those two blocks, it was possible to get caught up in the earnest passion of the crowd, the frustration that so little has changed. My heart sang to see several bicycles among the protesters, symbols of the union of my various political and policy positions. But I’d have come away less optimistic had I not come away with the sense that others better equipped than I to understand the crisis also thought that, just maybe, these protests might be the harbinger of real change. As my son and I walked those two blocks, I noticed a tall black man grab the hand of his young son – maybe three or four – and lead him across Broadway through the crowd. He was determined to get him a better view of the event.